The left sidebar of the new web design now features links to the news feed, friends, messages, friends and Facebook applications. These applications include both built-in Facebook applications such as Photos and custom made applications such as Rapid Wish List (in the Facebook screenshot above). The sidebar also includes direct links to the top online friends in your Facebook instant messaging, providing you are signed into Facebook’s chat system, which is not the case in the screenshot shown above. 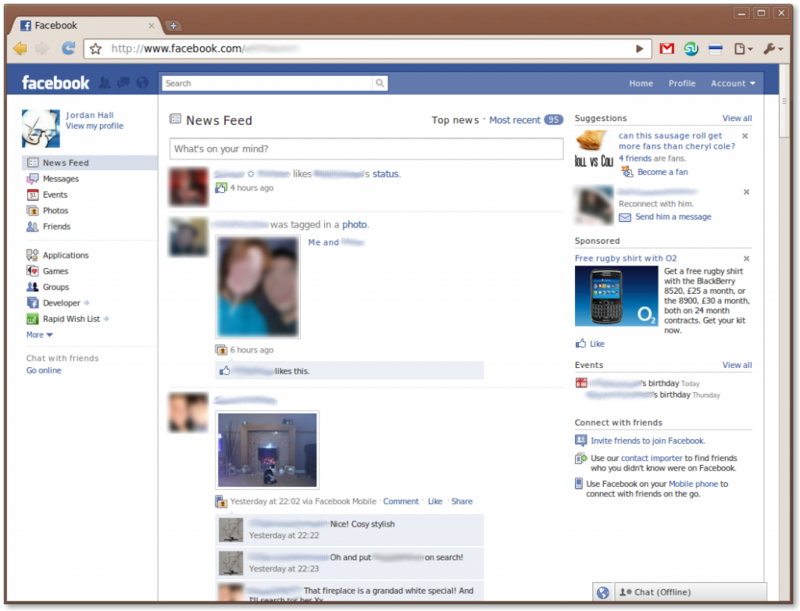 Hopefully you enjoy the new web design Facebook has adopted, but as always there are many Facebook groups which heavily dislike the new changes to the Facebook web design. This is always the case with Facebook design changes it seems. What do you think? Do you like the changes or find that they make the website more difficult to use? If you’re interested in a new web design for your website, whether minimalist like Facebook’s new design, or much bigger and bolder, please feel free to contact us. We do web design, web development, the creation of dynamic PHP-powered web applications and search engine optimisation and much more. Take a look at some of our other work.